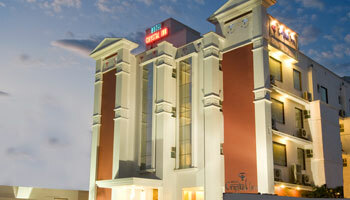 Welcome to Hotel Crystal Inn Agra. Our convenient location makes us the ideal comfortable accommodation Agra has to offer. With less than half a Kilometer (0.5 KM) from the mesmerizing Taj Mahal Agra and most other historic sights or bazaar being at a walking distance, Hotel Crystal Inn Agra is most suitably located for a traveler. The Hotel offers 32 well appointed rooms which are quite spacious and tastefully decorated in modern setting. Away from the stress of the city (Traffic). Hotel Crystal Inn Agra aims to soothe your body, simulate your mind and strengthen your spirit’s. Breakfast Services, Room Service, Travel Counter, Laundry Facilities, Backup Generator, Airport Transportation, Doctor on Call, Currency Exchange, Security Guard, Parking. Attached Bathroom, Cable/Satellite TV, House Keeping, H/C Water, Toothbrush/Razor on Request, Iron/Ironing Board, Wakeup Calls, Air Conditioning Room, DVD Player.